It’s a treat to finally see your baby take those tiny steps after successfully meeting all the motor milestones, finally all set to explore the vast world around him. As parents, the onus is on you to prepare your baby to walk on his own by taking the proper initiatives right from his birth. The average age when children begin to walk is between the ninth and twelfth month. By the time they are fifteen months old, their walking gets better. However, some may even walk as late as the seventeenth month . It is essential for him to complete all his other motor milestones, like tummy time, rolling over in all directions, crawling and sitting unsupported with ease, so his back, shoulder and leg muscles are strong enough to help him be on his feet and move around. You may contribute to making your baby an early walker by going the extra mile and helping him complete each of his gross motor skills conveniently. After he is about three months old, massage his legs gently when he is lying on his stomach, to make them strong. As he successfully rolls over in a front-to-back and back-to-front motion by the fifth or sixth month , continue strengthening his legs by introducing exercises like pushing his limbs back and forth in a cyclic motion . After he learns to sit unsupported by the eighth month , implement techniques to make him more mobile. For instance, by keeping his toys at a little distance, you would be teaching your baby to balance using his arms as he attempts to get them, which would, in turn, prepare him for his next milestone, crawling [12,13]. Once he has a good control over his arm, leg, and back, he would descend from his sitting posture, going on all fours by the ninth or tenth month. To make him more confident and agile in his movements, scatter his playthings all over the room, as the desire of acquiring them would get him to proceed at an increased speed . When he is almost a pro at it, make him crawl up and down the stairs for better balance, though ensure that you supervise his movements. Do not panic if he skips crawling, directly moving on to standing and walking as this is completely normal . Once your baby can stand without support, his body and feet have acquired the balance essential for walking. Bouncing up and down would make his hip and leg muscles stronger, also giving him an improved body balance, that is essential to walk with ease. Therefore, make your baby stand on the bed or your lap, hold his hands, and he would instantly begin to go up and down . After he can stand, which mostly happens by the eleventh month , he may need help to sit back. Do not assist him but bend your knees to show how he can come to a sitting posture again without falling or tumbling . Have a carpet or rug placed on the floor to prevent your baby from hurting himself even if he falls . When your little one shows the ability to get up on his own and stand unaided for long durations, it is a positive sign indicating that he would walk soon . Standing on his feet gives him the liberty of cruising around the room by taking support from furniture or anything within his reach, which is perhaps the last milestone to achieve before walking. Keep his toys on the bed or sofa, and the pursuit of getting it would instill the urge of proceeding further [7, 8, 9]. After he acquires body balance and manages to pull himself up, hold his hand and help him take baby steps . When your child is beginning to get more stable in his movements, let go of your support. As you sit on the ground, summon him towards you and cheer for every step he takes unaided. Give him attractive walking toys: Get your child interesting playthings when he is learning to walk, so he may not find it to be a tedious or monotonous exercise. 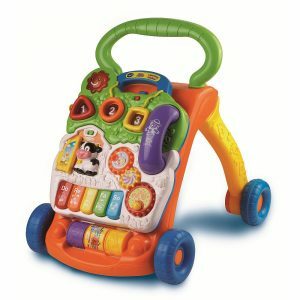 Walk behind toys like a toddle truck, or a push walker would be a good choice while teaching him to walk. He would hold on to these toys while standing or moving about, thus resulting in an improvement in his motor skills . Make him practice: As soon as he has taken those first magical steps, allow him to walk as much as possible on flat surfaces. While setting your baby down, put him in a walking posture rather than sitting, and your tiny tot would try approaching forward with those small steps. Take all the safety measures possible but do not panic if he falls or trips as your scary reaction may dampen his spirit. Minimize lap time: After he is up on his feet make sure you do not carry him too much as he would lose interest in his newly developed skill. Bring a peer: If there is a child of a similar age in your family or neighborhood, consider arranging for a play date where each would try to show their newfound skill to the other. Even though comfortable shoes are important at this stage, allow him to move about barefooted as much as possible when indoors for balanced and coordinated movements . 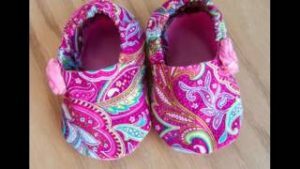 The American Academy of Pediatrics recommends leather or mesh footwear that is lightweight and flexible with rubber soles to give the baby’s feet sufficient breathing space as well as to avoid slipping and sliding . Though hard bottom shoes might bring in some discomfort to your child, it would be beneficial in the long run, giving his feet a proper shape. Some parents even prefer cruiser shoes for the initial months of walking, though it may not be necessary. If you are scared on the sharp edges of furniture hurting his feet, opt for nonslip socks or booties . Baby proof your house well by putting gates at the entry and exit of staircases, as well as keeping objects like knives, scissors, shampoo, hair dryers, and kitchen appliances out of his reach . Refrain from using baby walkers since it is not considered to be safe by the American Academy of Pediatrics, due to the chance of triggering accidents by giving infants access to sharp and harmful objects. They also lose out on flexibility by becoming over-dependent on it [21,22]. Flat feet and toe walking are common in kids that usually get resolved by the time they are three years of age. Consult a doctor if it lasts longer as physical therapy and exercises might be required to overcome them in some cases . Thank you so much for such a nice and informative article about the baby walk. I’m so much excited because of my sweet baby growing up perfectly. My baby starting step to walk. This is one of the best memorable moment in my life. I need a suggestion from you. One of y friend suggests me to buy an Baby Walker for my baby. But I’m confused about its health value. Is it good for health? If you have any suggestion please leave your valuable comment. Nice blog. I think it will helpful to encourage baby to walk. Really inspiring idea.Thank for such a helpful guide. Great article dear. I think it will help other parents as like me to encourage their baby to walk.